Roderick Edward "Legs" McNeil (b. 1956 in Cheshire, Connecticut), is the co-founder and a writer for Punk Magazine. He is also a former senior editor at Spin Magazine, and the founder and editor of Nerve magazine (print only; 1992). At the age of 18, disgusted with the hippie movement that seemed to be going nowhere, McNeil gathered with two high school friends, John Holmstrom and Ged Dunn, and decided to create "some sort of media thing" for a living. They settled upon a magazine, assuming that people would "think they were cool and hang out with them" as well as "give them free drinks". The name "Punk" was decided upon because "it seemed to sum up...everything...obnoxious, smart but not pretentious, absurd, ironic, and things that appealed to the darker side". 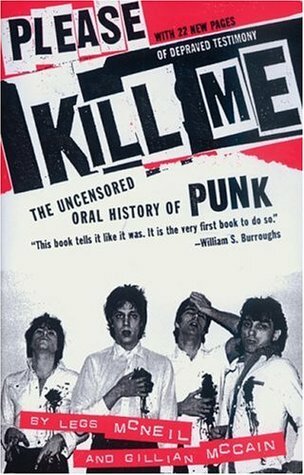 In Please Kill Me: The Uncensored Oral History of Punk, McNeil said that the magazine was inspired by two chief influences: Harvey Kurtzman and The Dictators' debut album The Dictators Go Girl Crazy!, indicating that the magazine was started strictly so that its creators could "hang out with the Dictators". Nicknamed "Resident Punk" in the magazine, he claims (to much dispute) that he was the first person (along with co-founder John Holmstrom) to have coined the term "punk" to describe a certain type of music, fashion, and attitude. He says he came up with the name punk because Telly Savalas used the line "You lousy punk!" on the show "Kojak." According to McNeil: "After four years of doing Punk magazine, and basically getting laughed at, suddenly everything was "punk," so I quit the magazine."